The Ian McLellan Hunter Award was established in 1992 and named in memory of longtime WGAE member Ian McLellan Hunter. The award is presented to a WGA member in honor of his/her body of work as a writer in motion pictures or television. Hunter’s more than 20 screen credits include Eye Witness and A Woman of Distinction. Harassed by the blacklist in the 1950s, Hunter went on to write several successful television series under a pseudonym and then reemerged as a writer on many television projects, including The Blue and The Gray. Appropriately, the first recipient of the Ian McLellan Hunter Award for Career Achievement in Writing was Hunter’s longtime friend and writing partner, Ring Lardner, Jr., whose movie credits include Woman Of The Year, M*A*S*H and The Cincinnati Kid. The Herb Sargent Award for Comedy Excellence was created in 2006 in honor of Sargent, who was president of the Writers Guild of America, East, for 14 years until his death on May 6, 2005. The Herb Sargent Award is awarded to a writer who embodies the spirit, commitment, and comic genius of Mr. Sargent as well as his dedication to mentoring new writers. A legendary writer and television producer, Sargent’s credits include being a writer/producer of Saturday Night Live for more than 20 years, the screenplay of Bye Bye Braverman, television specials for Bing Crosby, Milton Berle, Perry Como, Sammy Davis Jr., Alan King, Paul McCartney, Lily Tomlin, and Burt Bacharach, as well as extensive work in radio in the 1940s. The Richard B. Jablow Award was established in 1978 to recognize devoted service to the Guild. It was created in honor of Richard B. Jablow, who helped found the WGAE, authored its constitution, and served as its first counsel. The Walter Bernstein Award was named in honor of one of the Writers Guild East’s most distinguished and courageous members, the Walter Bernstein Award is presented to honor writers who have demonstrated with creativity, grace and bravery a willingness to confront social injustice in the face of adversity. 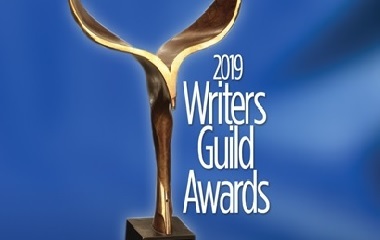 The Writers Guild of America, East Foundation’s Michael Collyer Memorial Fellowship in Screenwriting is funded by the Charles and Lucille King Family Foundation, and is awarded to a student who plans to pursue a career in screenwriting upon his/her undergraduate course of study. The recipient receives a $10,000 stipend to write an original screenplay under the mentorship of a prominent screenwriter. The fellowship honors Michael Collyer, a distinguished entertainment attorney in New York City, who for four decades practiced primarily at his namesake firm Kay Collyer & Boose and specialized in television financing and production. The John Merriman Award for Study in Broadcast Journalism at American University honors John Merriman who was WGAE president and also news editor of the CBS Evening News with Walter Cronkite when he was killed in the crash of an Eastern Airlines jet in Charlotte, N.C. in 1974. The award honors Merriman’s passion for good grammar, writing, and journalism, and supports the graduate broadcast program founded by CBS News colleague and friend, Ed Bliss. Walter Cronkite presented the first Merriman Award in 1975. James Schamus will present Leonard with the Award at the NY ceremony.